Blackpool’s tangerine dream turned into a nightmare with relegation on Sunday but they were the best value team in the Premier League in the 2010-11 season, according to an analysis by sportingintelligence of cost per point in wages. The Lancashire Oranjie spent an estimated £476,923 per point on football club wages during the season, by far the lowest amount in England’s top division. If Champions League places for next season were handed out on the basis of cost-per-point value then Ian Holloway’s side would be joined at Europe’s top table next season by West Brom (£666,170 per point), Wolves (£712,800) and Birmingham (£894,462). Wigan would be heading for the Europa League in fifth place (£902,571), while Liverpool, Chelsea and Manchester City would be relegated. (See table below). Terms of engagement: To reach our figures we began by looking at wage bills at each of the 20 football clubs (as opposed to their parent companies) for the most recent season available, 2009-10. So for Bolton, for example, the accounts of Bolton Wanderers Football & Athletic Company Limited, as opposed to Burnden Leisure, which also owns a hotel. For Liverpool, it was the Liverpool Football Club and Athletic Grounds Limited, not the parent company, and so on. The specific figures we used from each set of accounts was ‘Wages and salaries’ (not the headline total wage bill, which includes social security payments by clubs but not to staff). In Liverpool’s case, the relevant number was £108.549m, for example, while at Birmingham it was £32.3m, and so on. Next we adjusted the 2009-10 numbers for wage inflation (in all cases) and for promotion (in the cases of Newcastle, West Brom and Blackpool, whose wage bills will naturally have increased to a significant extent from 2009-10 in the Championship). And then we divided the total by the number of points. These wages include pay for all players, managers, coaches, back-up staff and other FC staff. As a like-for-like comparison, it’s probably as close to accurate as we can get short of actually having 2010-11’s numbers. End of technical bit, as Jennifer Aniston might say. On this basis, Liverpool provided the worst value for money, with each point costing a shade over £2m, and they were followed in poor value by Chelsea and Manchester City. Of course, every point matters, and before the final game of the season, Manchester City were actually bottom of the table. Their three points on the final day elevated them to 18th place. In total, we calculate the 20 clubs spent around £1.285bn on pay to football club staff (by our definition above), earning 1,029 points at an average cost of £1.25m per point. 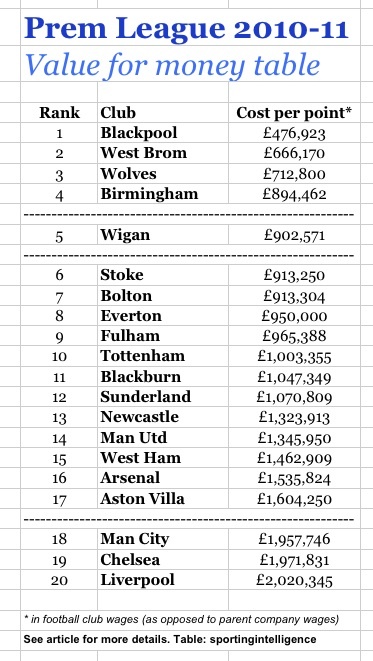 On that basis, 12 clubs spent below average amounts (see table), while Newcastle and Manchester United spent within £100,000 per point of the average, and six clubs spent much more.